Every election year, America’s attention turns to politics. With Donald Trump and Hillary Clinton furiously campaigning across the nation America becomes very interested in who’s leading in the polls. Polls, otherwise known as opinion polls, are simply surveys of the public in order to see which candidate would receive more votes on Election Day. A sample size of registered voters is created in order to gain a relevant amount of data for a given state or country. Whomever has the advantage in the polls will most likely become president come Election Day. The media puts a heavy amount of focus on every major poll taken, even us because it is almost a status update on the election itself. But with the changing times and technology are polls as accurate as they were 30 years ago? The first instance of popular polling in American politics came in the form of straw polling in 1824. The poll helped determined who would likely win the presidency between Andrew Jackson and John Quincy Adams in a time where communication was limited. Seeing as how the poll accurately predicted the winner to be Andrew Jackson is gave credibility to the system which would become a mainstay in politics. Flash forward to today and polling is conducted very differently than it was in 1824. Instead of using straw polls, telephone polls are conducted in order to reach a greater number of registered voters. However, because of the dwindling amount of phone landlines polling has been forced to adapt. Landlines have been the polls greatest friend throughout the 19th century. Not only did most American households have them by the 1960’s, but area codes were implemented to ensure the phones location within a state and county. With the introduction of cell phones landlines have quickly become a thing of the past. In 2006 less than one-in-ten Adult Americans had wireless phones, in 2015 that stat increased to five-in-ten According to the National Center for Health Statistics. More people are using cell phones and disconnecting their landlines. Polling has evolved its strategy by dialing more cell phone numbers to gain accurate data. But cellphones are also added to the headache of accurate polls. Landlines indicate the phones location due to the area code, but portability of cell phones results in people keeping the same number if they move to a new state. A Pew Research Center Study 1 reports “that 10% of U.S. adults have a cellphone number that doesn’t match the state where they actually live. For urban dwellers, some 41% have a number that doesn’t match the city where they live.” While this isn’t a major problem, it effects data for those polling in a specific region or state. 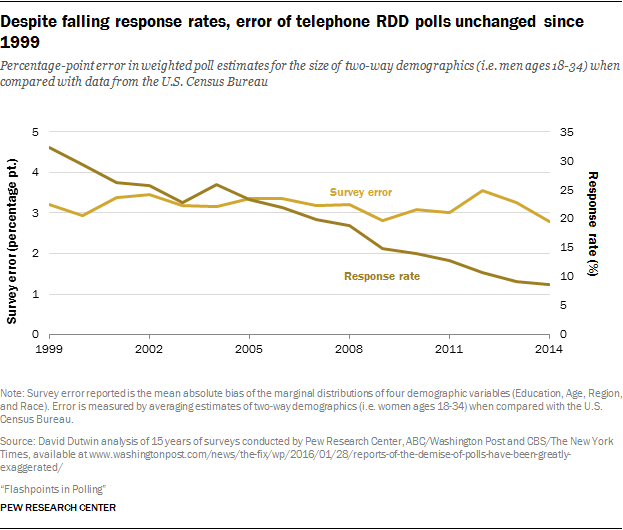 A bigger problem in polling is not dialing the right number, but getting someone to answer. Finding voters to poll is just as difficult as creating strategies on how to contact them effectively. Polls have to speak with a number of registered voters who will actually take the time to vote on Election Day in order to fill their sample group size. Response rates over the years have dropped. The same Pew Research Center Study mentioned before conducted a survey in 1997 and reported that the telephone response rate was around 37%, when the study was revised in 2012 for an update the response rate plummeted to 9%. Many Americans today are too busy to be bothered by polls or feel odd about answering a strangers political questions. The population was much more willing to participate in such surveys in the 1980’s the same time newspapers were considered one of the best news sources. Even though response rates have been in decline, survey error has remain essentially stable since 1999. With all the setbacks of landlines and cellphone some feel that polling should be primarily held on the web. It is obvious why polling for use the internet in order to reach more voters. As one of the greatest inventions of the 21st century it would be ludicrous not too. Online polls can easily reach more Americans who are willing to comply with the survey and costs less to run. But online polls do have a disadvantage. Pew Research Center reports that because there is no random sample data for online polls to go off of it can lead to inaccuracies depending on the demographic as well as key racial and ethnic groups. When 9 different online polls from different vendors were analyzed it showed varied results. Because of the amount of weighting needed to be done for online polls, telephone polling and RDD is still the preferred method among experts. The polls have not always predicted the winner of elections. In 1948 multiple major polls had Thomas Dewey beating Harry Truman by a spread of 5 to 15 points. Truman would end up winning by 4 points. In 2012 it was predicted that Mitt Romney would beat President Barack Obama by his own campaign polls by a close margin. But President Obama won by a margin of almost 5 points. Most recently in the 2016 race Hillary Clinton was projected to win the Michigan Primary by double digits over Sen. Bernie Sanders. But Bernie Sanders ending up winning Michigan by 2 points, even though he would end up dropping out of the race and supporting Hillary. Even though polling has remained accurate throughout time and advances in technology, there has still been instances of polling being wrong. While historically polling has had a very good record predicting the winner of elections the amount in which they win has usually been a lot smaller than anticipated. As technology changes the way we communicate, polls must advance as well to remain accurate. While polling is still a very effective way of gauging the public’s views margin of error proves that it is not a perfect system and mistakes can be made.